Louie Perry Anderson was born on 24 March 1953, in Minneapolis, Minnesota USA. He is a stand-up comedian, actor, author and television host, probably most famous for hosting the TV game show “Family Feud”. So just how rich is Louie Anderson? Sources state that Anderson has accumulated a net worth of over $10 million, as of mid-2016. His wealth has been established through his career as a stand-up comedian, through his involvement in the film and television industry, as well as through publishing his books. Anderson grew up in St. Paul, Minnesota, along with his 10 siblings, and attended St. Paul’s Johnson Senior High School. In 1981 he won first-place trophy at the Midwest Comedy Competition, which led the competition’s host Henny Youngman to hire him as a writer. Three years later, the comedian Johnny Carson offered Anderson the chance to make his national television debut as a stand-up comedian on “The Tonight Show”, which was the real start of his brilliant career. He went on to make guest appearances in popular shows such as “The Tonight Show with Jay Leno“, “The Late Show with David Letterman“, “The Late Late Show with Craig Ferguson“, “Comic Relief”, and numerous Showtime and HBO specials, establishing himself as a popular comedian with the USA audiences. His net worth started to rise. In 1988 Anderson appeared in the Eddie Murphy comedy film “Coming to America”, and in the camp comedy “The Wrong Guys”. The following year he made a guest appearance in the first episode of the NBC television series “The Jim Henson Hour”. In 1995 he created and produced the animated series based on his own childhood, “Life with Louie”, – the series aired on Fox, and lasted for three years becoming highly popular, winning two Emmy Awards for Outstanding Performer in an Animated Program as well as three Humanitas Prizes for writing in a children’s’ animated series, which made Anderson the only three-time recipient of this award. The following year he created “The Louie Show”, in which he also had a starring role as a psychotherapist, with the show airing on CBS for six episodes. Both “Life with Louie” and “The Louie Show” considerably added to Anderson’s net worth. The year 1999 saw the entertainer hosting the new version of the television game show “Family Feud”, and remained on the show until 2002, being replaced by Richard Kam, but meanwhile in 2001, he appeared in the television game show “The Weakest Link” and won $31,000. In the years since, Anderson has toured around the USA doing stand-up comedy and has tackled a mix of television work, appearing in series such as “Scrubs” and “Grace Under Fire”, dramas like “Touched by an Angel” and “Chicago Hope”, and shows like “Tom Goes to the Major”. 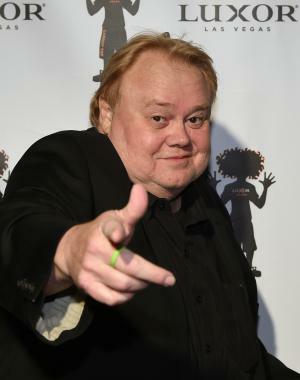 In 2012 he created and produced the stand-up special called “Louie Anderson: Big Baby Boomer”, and appeared in the ABC reality television series “Splash” the following year. In early 2016 Anderson joined the cast of the FX comedy series “Baskets”, with a starring role as the woman Christine Baskets. His performance brought him a nomination for the 2016 Primetime Emmy Award for Outstanding Supporting Actor in a Comedy Series, and has greatly added to his wealth. Aside from his career as a stand-up comedian and actor, Anderson has also written three best-selling books: “Dear Dad – Letters From An Adult Child”, “Good-bye Jumbo… Hello Cruel World” and “The F Word: How To Survive Your Family”. Additionally, in 2014 he became the promotional spokesperson for Land O’Lakes Sweet Cream Butter, and has since been featured in various ads of the product. Speaking about his private life, Anderson married his high-school sweetheart in 1985, but the marriage ended in separation after only a month, and eventually divorce. There is no information on any other relationships. The entertainer was involved in a blackmailing incident in the late ’90s. Reportedly, an Arizona man blackmailed him, threatening that he would reveal to the media that Anderson once offered him money for sexual favors. Being afraid that such controversial news could damage his rising career, Anderson gave the money. However, when the man tried to extort an additional $250,000 from him, the comedian informed authorities and the man was arrested. 1 I hope I'm not on E! True Hollywood Story (1996) 'til I'm dead. 2 [in 2002, commenting on the revised Family Feud (2002) with Richard Karn succeeding him as the host] My prediction is that the show's off the air within a year. 3 [on his immense weight] My first words were "Seconds, please". Most kids in kindergarten napped on a little rug. I had a braided 9 x 12. 2 In a 2002 episode of E! True Hollywood Story (1996), he stated that, after being chosen to host the 1999 revival of Family Feud (1999), he wanted the blessing of original host Richard Dawson. For that reason, the studio invited Dawson to make a guest appearance on the premiere episode and "pass the torch" to Anderson, but Dawson declined the invitation. 3 The Real Ghostbusters (1986) character, "Dr. Ray Stantz", was based on his voice and appearance, Dan Aykroyd's appeal to the occult and technical know-how and John Belushi's comedic delivery. 4 In 2000, Anderson was blackmailed by a man threatening to reveal to tabloids that Anderson allegedly approached him in a California casino requesting sexual acts in 1993. Fearing the story would threaten his starring roles in two family-oriented series, Louie initially paid a large amount of extortion money, but when the blackmailer's demands increased, Louie went to the police. The man was arrested and sentenced to 21 months in prison. 5 Shot the pilot episode of the popular 80s/90s sitcom, Perfect Strangers (1986). Louie played the role of "Larry", alongside Bronson Pinchot, who played "Balki". Believing Bronson and Louie did not have the right chemistry, Louie's part was recast for the series, and played by Mark Linn-Baker. 6 Biography/bibliography in: "Contemporary Authors". New Revision Series, vol. 137, pages 2-3. Farmington Hills, MI: Thomson Gale, 2005. 7 Had said that he did not even like his sitcom, The Louie Show (1996) due to all the changes CBS made to it. 9 When ABC's Who Wants to Be a Millionaire (1999) hit the air, Louie thought it would be a good idea to raise the Family Feud (1999) jackpot from $10,000 to $20,000. He got his way, and Family Feud's ratings went up as a result. The jackpot had been $10,000 for many years. 10 Shortly after the attacks on New York City of 9-11-01, Louie came up with the idea that they do a special NYC police vs. firemen week for the show, the prize money going to the NYPD and FDNY Widow's Fund. Louie put his own personal money to start a pot at the beginning of the week -- $75,000. 11 30 September 2003 - Recovering in an LA hospital for treatment of an undisclosed heart problem. 13 In 1981, met comedy legend Henny Youngman, and began writing one-liners for him. 14 Formerly worked as a counselor at a home for abused children. 15 Is the tenth child out of eleven children. "Dear Dad: Letters from an Adult Child" "Family Feud" (1999-2000) "Goodbye Jumbo... Hello Cruel World" "Life with Louie" (1994-1998) "Match Game" "The F Word: How to Survive Your Famil" $10 million 1953-03-24 35th Daytime Emmy Awards Actress Advertising Alec Baldwin American Broadcasting Company American Idol American stand-up comedian Anderson Live Arizona Baby boomers Broadcast network Celebrity Family Feud Chicago Hope Comic Relief Craig Ferguson David Letterman Daytime Emmy Award for Outstanding Performer In An Animated Program Emmy Award Entertainment Henny Youngman Interpersonal relationship Johnson Senior High School (Saint Paul Lance Bass Land O'Lakes Louie Anderson Louie Anderson Net Worth Massapequa Minneapolis Minnesota Net worth New York Primetime Emmy Award Reality television Richard Kam Saint Paul Scrubs (TV series) Showtime (TV network) Stand-up comedy The Jim Henson Hour Touched by an Angel U.S.